Was Ancient Egypt Visited by Beings from Star System Syrius? To paraphrase (1): It’s said that the Egyptian pharoah Akhenaten may not have been human. The sculptures of the royal couple depict, for instance, an elongated head. Such skulls have been found elsewhere on Earth. Akhenaten’s reign was noted for realistic art work, so it could be that his head really was elongated. Here is a picture of Akhenaton. 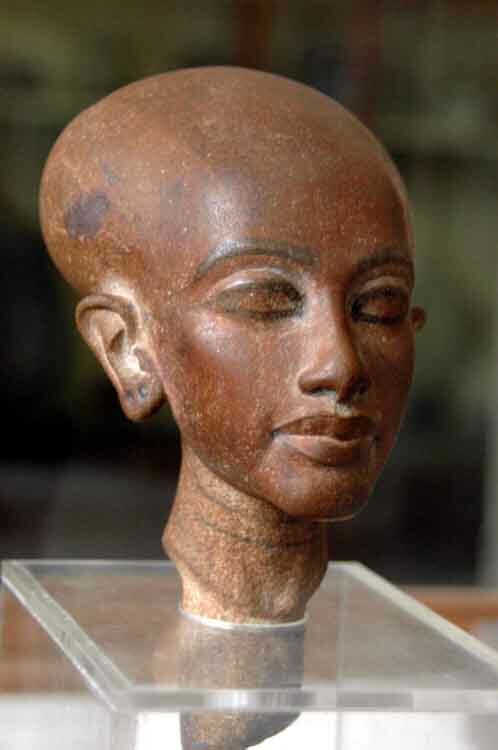 The big hat may conceal a very elongated skull: http://www.trionfopublishing.com/Matthew/akhenaten2.jpg .. Here is a picture of one of Akhenaton’s daughters. It looks like she inherited the full long-head genetic makeup. So her mother might be supposed to have been Akhenaton’s non-human wife: http://www.ancient-egypt.co.uk/cairo%20museum/cm,%20akhenaten/images/akhenaten’s%20daughter%201.jpg .. 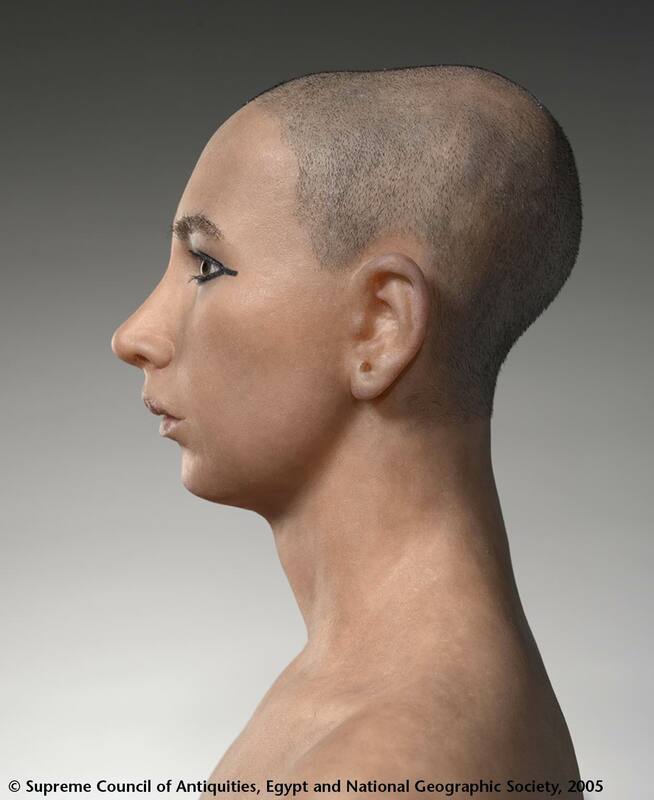 Here is a picture of Akhenaton’s son Tutenkhamon; it’s a reconstruction from his mummified body. From this picture it might be supposed that Tutenkhamon’s mother was human: http://www.guardians.net/hawass/Tut/images/Tut%201.%20French%20Team.jpg . 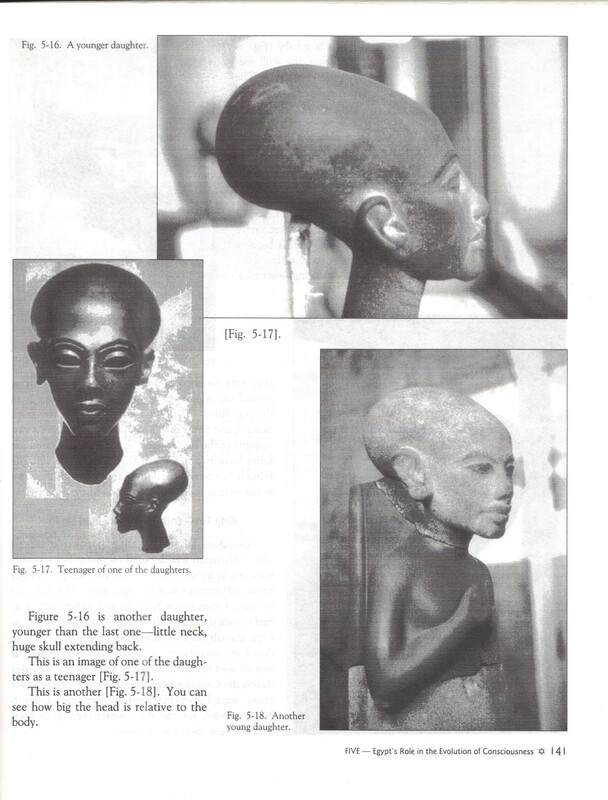 More pictures purported to be of Syriun beings – I think these may be children of Akhenaton. The source may be the book “The Ancient Secret of the Flower of Life” by Drunvalo Melchizedek … https://acastdotme.files.wordpress.com/2012/03/sirian-humans1.jpg ..
See also this section: “Elisabeth Haich on the Race of Elongated Heads,” at https://cosmicktraveler.wordpress.com/physical-evidence-of-humanoid-beings/9-non-human-intelligent-beings-on-this-earth-in-past-and-present-page2/ .. Here is indirect evidence: https://iamofthestars.files.wordpress.com/2013/01/d29b6-sirius-and-giza-pyramid.jpg ,. To paraphrase (3): The builders of the Sphinx aligned it precisely with the star system Sirius. Because this star system is fixed, it can always be seen while looking south at night from anywhere in the Northern hemisphere. See “21 March 2012 – Expansion of Third Eye, Sirian High Council,” a post by Amara Tia Ann at “ACAST.Me,” http://wp.me/P22lmc-ry .. Practice this on the New Moon: Amara Tia Ann’s Syrian Third Eye Activation: http://acastdotme.files.wordpress.com/2012/03/sirian-3rd-eye-expansion-21mar2012.mp3 ..
Another tool is the Siriun Ascension Meditation by Solara-An-Ra: http://www.solara.org.uk/meditation.aspx?element=178 ..
(1) from “Living Ma’at” by OMni, http://lightworkers.org/blog/175511/living-maat ..
(2) “Law of One” The Ra Material,” http://www.lawofone.info/ .. This entry was posted in Egyptian religion, Sirius, Star brothers and sisters - exobiology (see also 'Council of Nine'), Venus and tagged Akhenaton, Ancient Egypt, science, star brothers, Syrians, Syrius on 29 January 2013 by Alice B. Clagett.